Last week, 340 scientists, resource managers, municipal planners, non-profit organizations, educators and citizens gathered in downtown Green Bay to discuss ongoing challenges and recent successes in managing and protecting water quality, habitat and species in Lake Michigan. The 2017 State of Lake Michigan Conference hosted by International Association for Great Lakes Research was held at the Hyatt Regency, Nov. 7-10. About 40 attendees were affiliated — either as faculty, staff, students or alumni — at UW-Green Bay. Many led presentations, poster sessions and field trips. Research and analyses conducted through UW-Green Bay was on display and included topics such as beach and wetland restoration, fisheries, invasive species monitoring and management, health, and water quality in Lake Michigan, especially in the Fox River and Bay of Green Bay. The regional conference broadens discussion of lake-specific issues by connecting researchers to resource managers to policy makers. Attendees heard from top experts in their fields, participated in stakeholder discussions, and workshops related to education, communication and policy. Three field trips to the Lower Fox River watershed and the west shore of the Bay of Green Bay highlighted conservation efforts underway to reduce nutrient and sediment run-off, PCB remediation, habitat restoration and shoreline revitalization efforts by local communities. 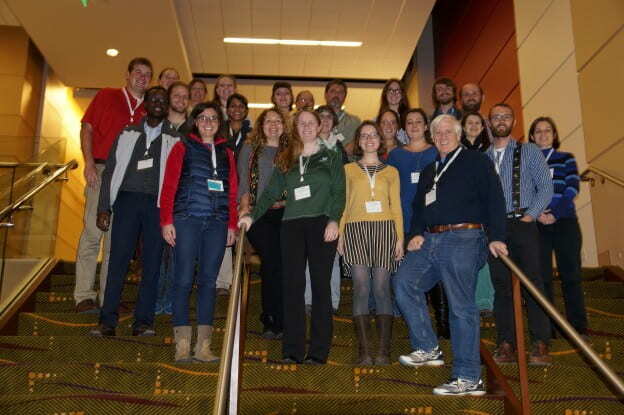 The 2017 State of Lake Michigan conference was the first of an annual series of conferences hosted by the International Association for Great Lakes Research with support from state and local sponsors, and was aimed at promoting linkages between the science and policy communities. Highlights from this year’s conference can be found by searching #SOLM17 on Twitter. This entry was posted in Go Green! and tagged Biology, Cofrin School of Business, CSET, Environmental Science on November 15, 2017 by Sue Bodilly.